For many decades, AM processes have been used for rapid prototyping. Over the last few years, additive manufacturing has gained incredible interest in all industry facets: from aerospace applications to simple one-off consumer home builds. This technology has immense versatility and flexibility, due to its ability to create complex geometries with customizable material properties. Additive manufacturing gives great freedom in design: objects of any shape or geometry are produced from a 3D model or from a design fed into the 3D printer by a computer. The additive manufacturing processing of metals makes it possible to design and build lightweight parts in real time, as 3D models can be printed or fabricated directly using a laser source or electron beam source and a powder bed. Metal 3D printing can produce highly customized parts with added improved functionalities that are not possible through traditional processes. Metal 3D printing is an AM technique that includes processes such as selective laser melting (SLM), where fine metallic powder is melted layer-by-layer to create three-dimensional metal parts. Furthermore, the selective laser melting in particular allows the manufacturing of components with hollows and undercuts, with thin walls and hidden voids. Selective laser melting of different types of alloys suits perfectly the needs of lightweight applications involved in vehicle and engine technology. Mixing different raw materials as titanium, aluminum, stainless steel or nickel based alloys and discovering new alloys of various strengths and temperature resistance is close to impossible through conventional manufacturing methods. 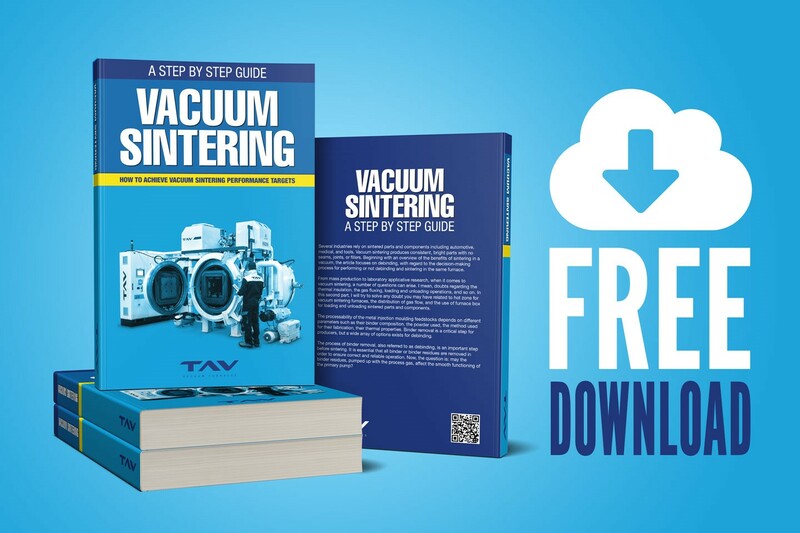 This article delivers insights to help you understand potential of heat treatments in vacuum for 3D printed parts, with a particular focus on SLM Ti6Al4V. 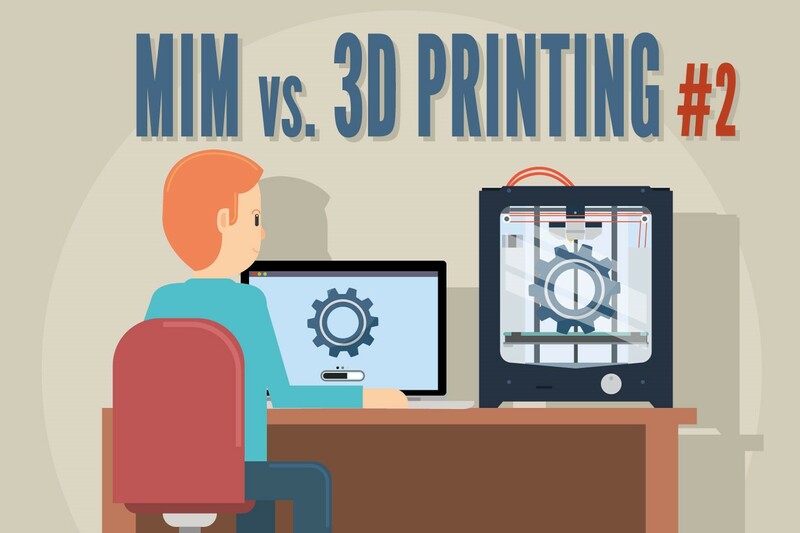 Additive manufacturing is a disruptive technological trend that is going to influence the future of the manufacturing industry. 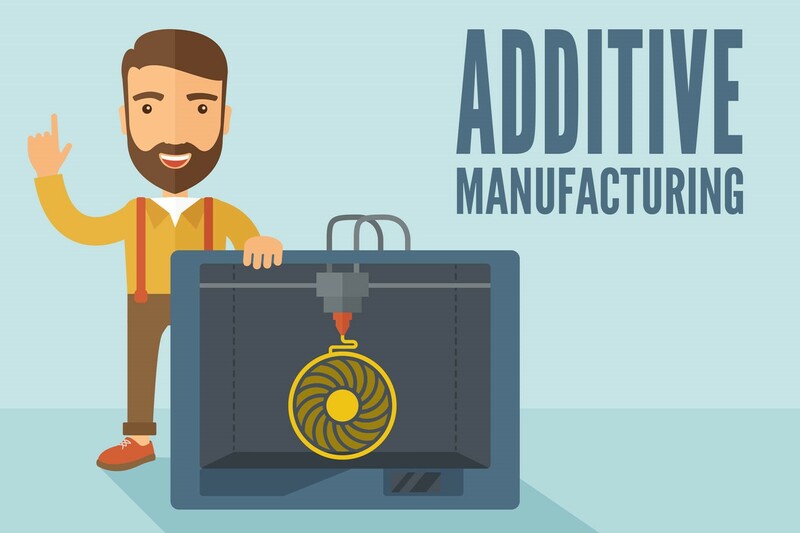 According to the Annual report on AM by Wohlers Associates, the global 3D printing industry revenues of additive manufactured products and services exceeded $2.2 billion in 2014. The global market for 3-D printing and services are expected to exceed $21 billion by the year 2020. Conceptually, AM consists of a digital CAD model of a part that is converted into a near-net-shape solid three-dimensional part. In selective laser melting (SLM), one of the emerging AM technologies, a metal powder is melted by a computer-driven concentrated laser beam to form the part. This process has a lower rate of deposition compared to other AM technologies but it results in a finer detailed product. The possibilities and benefits of SLM are many and exciting. The most important advantage is the fact that only the material needed to make the part is actually processed. Therefore, less input material will be needed for production. In addition, unlike subtractive manufacturing, AM has no design constraints on part geometry and allows one the freedom to design for functionality. Finally, additive manufacturing allows the development of a part to progress with great speed to market. The metals that are processed via the SLM method are already many and include Titanium, Inconel, Aluminum, Steels and Cobalt-chrome alloys, etc. 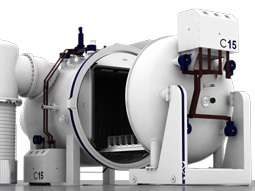 Typically, the SLM process is performed within an inert chamber in order to control oxidation of the heat-affected metallic pool. Since additive manufactured parts have near net shapes and complex geometries that are also impossible to machine, very little removal of material during downstream processing is the rule. 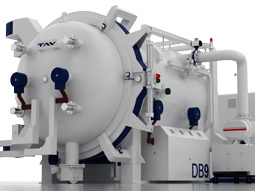 Therefore, the finished parts must never exhibit decarburization or contaminated surfaces from subsequent thermal processing. 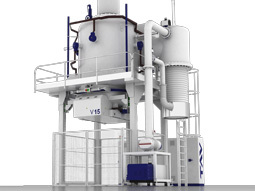 A well maintained vacuum furnace which operates totally devoid of oxygen, equipped with diffusion pumps in order to attain deep vacuum levels, and very precise temperature controls is therefore a critical piece of equipment within the additive manufacturing world. Furthermore, since in most cases it is desirable to produce parts without internal stresses, SLM parts are always heat treated after fabrication. 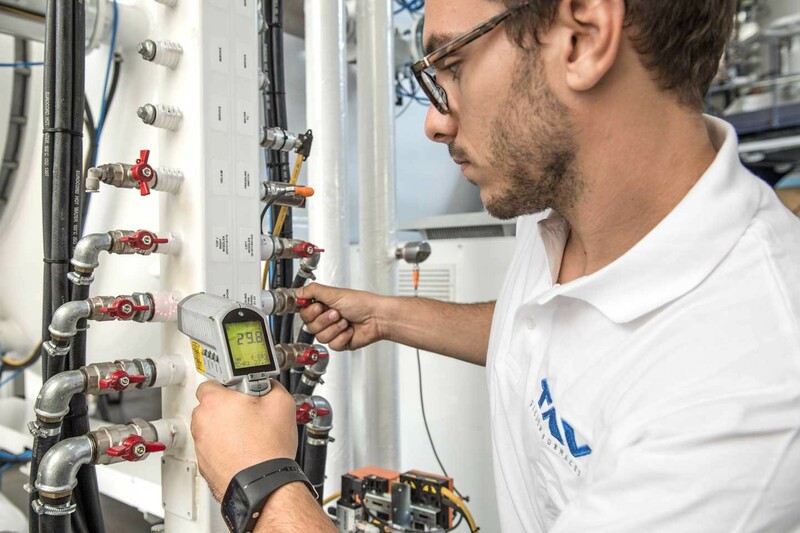 Additional heat treatments are specified to optimize the mechanical behavior, e.g. the elongation to failure, the fatigue strength, etc. Reliable mechanical properties are an essential prerequisite for series production of industrial components. It is known from the literature that AM generates new challenges in terms of material properties due to rapid cooling, defects or inherent surface roughness. While the tensile strength values have been well characterized for different heat treatments and surface conditions, significant complexity arises if the influencing factors on the fatigue performance have to be determined. The excellent strength and toughness, combined with the corrosion resistance, low specific weight and biocompatibility of titanium alloy Ti-6Al-4V, make it ideal for many high-performance engineering applications in aerospace and motor racing, but also for the production of biomedical implants. Let’s now see the fatigue behavior of SLM Ti6Al4V and the influence of the type of heat treatments after the SLM process. The microstructure of Ti6Al4V produced with the SLM process is different from wrought or cast counterparts. It is characterized by a directional solidification and cooling in the build direction. The directional solidification and cooling makes the grains grow in the building direction through the layers resulting in a columnar microstructure. This columnar microstructure gives the as-printed material anisotropic mechanical properties where the properties in the building direction (z) can be quite different from the properties in the plane perpendicular to the building direction (x,y). When a stress relief heat treatment in Argon at 380°C is applied, internal stresses are reduced but the coarse columnar microstructure remains unaltered, see Fig. 1a. On the other hand, heat treatment at a higher temperature (740 °C for 2 h) in a vacuum furnace eliminates residual stresses and modify the microstructure to a finer and equiaxed microstructure, see Fig. 1b. A fatigue testing program of SLM Ti6Al4V was carried out using a standard rotating bending specimen geometry and a new fatigue test method using miniature specimens. The new method was developed with the aim of minimizing the cost of fatigue testing programs (i.e the volume of the mini specimens is approx. 1/7 of that of the standard bending specimen) while guaranteeing greater usage flexibility, i.e. evaluation of surface, directionality and notch effects. Fig. 2 demonstrates that the new test method using mini specimens provide fatigue results that are coherent with the data obtained by the standard specimens. 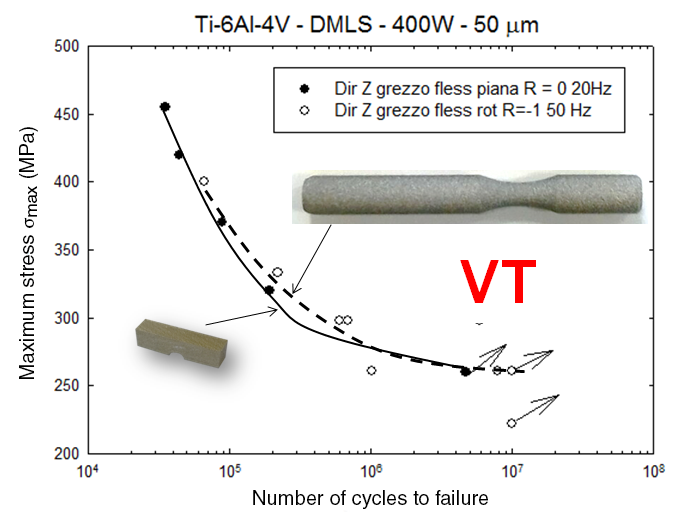 Fatigue curves of as-built SLM Ti6Al4V after heat treatment in vacuum (VT) obtained using a standard specimen geometry and a miniature specimen geometry. The influence of the heat treatment on the fatigue is discussed with the help of Fig. 3. Test data for the three specimen orientations after a stress relief heat treatment (SR). The scatter in the data is rather low and the fatigue trend curves are well behaved. However, the lives of specimens with long axis parallel to the direction of build (Z axis) are considerably different and shorter than other two specimen orientations (1 and 2) with the long axis perpendicular to the build direction. It is demonstrated and quantified the presence of an anisotropic fatigue behavior of DMLS (Direct Metal Laser Sintering) Ti-6Al-4V after the stress relieving treatment (SR) due to the columnar structure of Fig. 1.a. The test data for the three mini specimen orientations after the high temperature heat treatment in vacuum (VT) are shown in the same plot of Fig 3. The data scatter is again low but all three specimen data sets, irrespective of the long axis direction, are very similar demonstrating an isotropic fatigue behavior of the equiaxed structure of Fig. 1b. 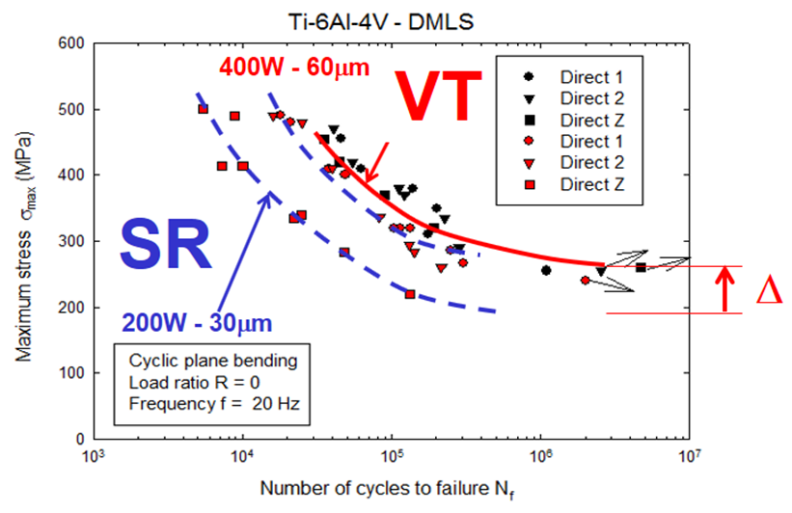 In addition, the representative curves show a significant fatigue strength increment of the VT material compared to the worst SR material. 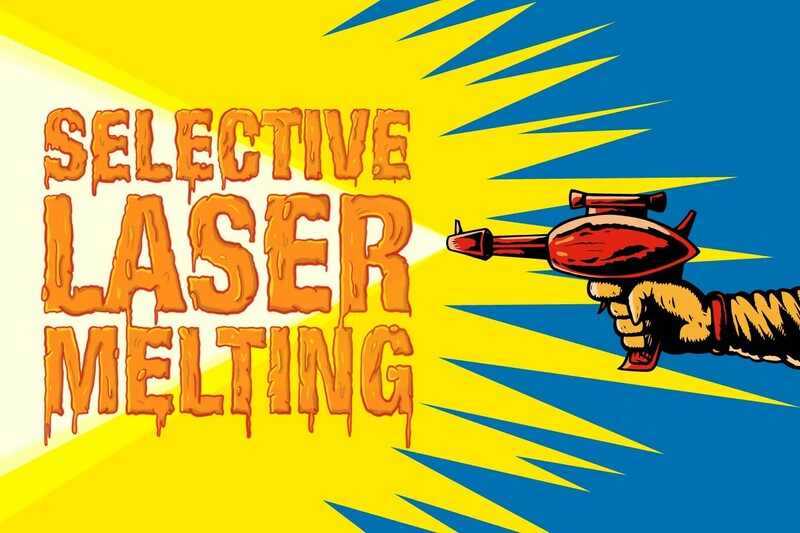 I hope you enjoyed this article mainly focused on selective laser melting (SLM), the 3D printing process used to create 3D metal prints. 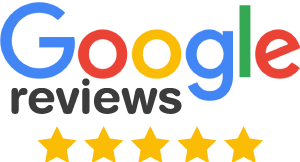 If you have any questions about additive manufacturing, or vacuum heat treatments, just make a comment below and I will post an answer. 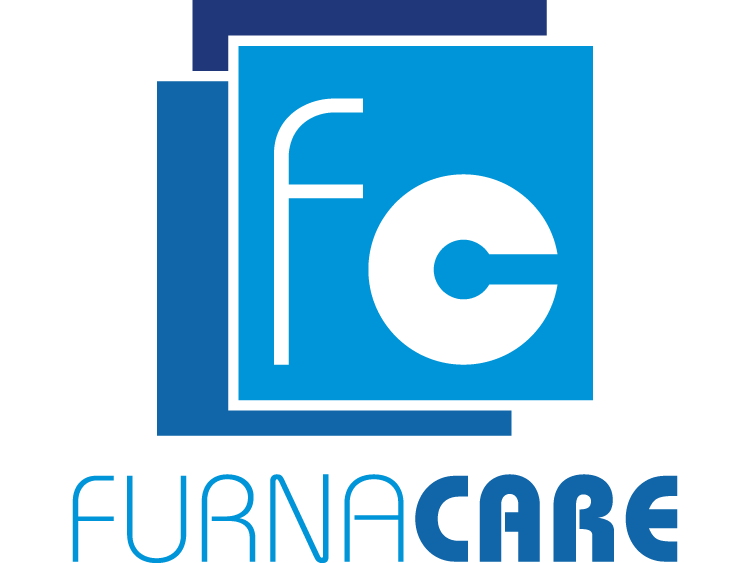 Take also a look at the slides here below, that I presented recently on this matter at the Metal Additive Manufacturing Conference organized by TAV VACUUM FURNACE. You are the reader number 9,216.